Before we go any further, there’s something you should know about me. I often think aloud, testing my thoughts as I speak them. In this way, it’s important to note that I see conversations as a two-way communication system where we each get to say what’s on our mind, but we reserve the right to be convinced of the other point of view. This, to me, is an important distinction because my wife likes to call my discussions “lecture-mode,” but really, I’m just a passionate person. I do still value discourse and varying opinions. So, if you disagree with me on any point, please feel free to leave a comment below. Warning: This is going to be a long post. Sound Off: As an Author, should you ever talk about your Politics online? This is a polarizing topic, and it’s one I’ve been struggling with for some time. The who writers-talking-politics thing is something I am resistant to discuss, but also something I feel deeply passionate about. Without any other way to reconcile the complex emotions I have on the topic, I’ve decided to break my silence. This last year has seen a huge increase in angry, in-your-face language shotgunned into the world toward folks with differing points of view. It’s almost become a de facto standard to brandish words like Sexist, Racist, Fascist, and Nazi in response to someone on the ‘Right’ who disagrees with you. The language I see most common on the ‘Right’ to describe those on the ‘Left’ includes Libtard and Special Snowflake, but I’m sure there are others, probably more offensive. Did you notice that my list of derogatory terms leans hard in one direction? I did too. I have a theory for this, which is based on my own interactions, especially post-election. I’ll discuss this point further down in the post. 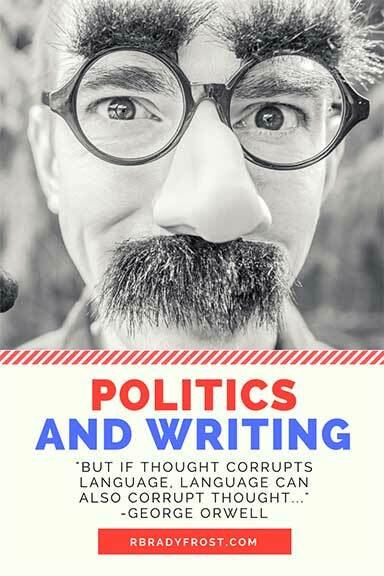 To give a hardline answer to the question of whether you should discuss politics as an author, I would have to say, “It depends.” This might come across as a total cop-out, but the truth is this: You are the only one who can determine the right answer, and there will always be consequences. Who are you to your tribe? I think award show acceptance speeches can be a great place to look for bad examples of spreading your political beliefs. For this reason, many people have abandoned the award shows, choosing not to watch due to the growing disconnect. With the right tone, and the proper amount of understanding, heart, and brevity, you might be effective at spreading your message, but the most common examples are intrusive, divisive, and generally frowned upon. At best, you’re probably talking to people who already share your political views. At worst, you might be alienating fans, fans who don’t have an opportunity to have a real conversation or any other way to disagree or state their opinion other than to reject the message. Do it enough or strike the wrong chord and they will reject you. If people are shutting down and no longer listening because of the way you’re sharing your beliefs, you’ve alienated the very people you’re trying to convince. How is that effective? The real consideration for most authors is their immediate tribe. Your current fan-base is a huge consideration when you’re making the decision as to whether you should discuss politics. Some people will invariably feel betrayed, but the good news is that the percentage of those who disagree with you and jump ship will probably depend on how you go about sharing your personal beliefs. In this way, I don’t think there’s necessarily anything wrong with using your platform for a cause you believe in, insofar as you respect your audience and choose the appropriate time, place, venue, etc. to share. This isn’t censoring yourself, but rather a tool used to effectively spread your intended message. There’s something important here, something I didn’t understand for years. When we create art: a story, a painting, a movie, a game, etc., we are only really creating half of the piece. The only time it is whole, for better or worse, is when the creator looks at it. (Still, even then, if it doesn’t challenge the artist’s own understanding, is it still art? But I digress…) The missing piece is brought to the artwork by those who consume it. The other half of your story lives inside each individual reader. This is why people can experience the same thing, but come to amazingly different conclusions. It’s why you can read certain books or watch some movies again and again and pick up on strange, new things. We grow based on our experiences and our stories change as we live our lives. This is why it’s so difficult to impart specific messages to your readers through your work, and those who try too hard are often rejected. Perhaps the often overused advice of ‘show, don’t tell’ is most powerful in this regard. Not everyone will get the message, but it’s bound to be more effective than using a brick. After discussing a bit of the basic background, I think it’s important to talk about the business aspects of sharing your political views. I’ll cover some of the negative consequences next, but since this post feels like it’s already leaning in one direction, let’s talk about the positive outcomes you might encounter after going political. The biggest possible outcome is that you might possibly change hearts and minds. This is largely dependent on your writing, your brand, your approach, and the receptivity of your reader base. How else can you see positive impacts of discussing politics? The following is written with a bit of theory-craft and a dose of cynicism, but I do think it’s very important to digest and consider if you come in pursuit of an answer regarding this highly debatable topic. When it comes to offending people in business, sometimes it can be a good move, as far as your bottom line is concerned. The real trick is to offend the right people. In response to calls for boycotts at Chick-Fil-A in recent years, the company saw an outpouring of support. Parking lots were full and drive-through lines seemed to stretch for miles. On the other side, Disney often gets flack for its support of the gay community. (I don’t have a problem with gay people, just to be clear.) Who do you think is likely to respond with an outpouring of support in response to calls for boycotts? LGBT people and those who adamantly support them, of course! Thank you for showing your support by not blocking ads on this domain! Likewise, sometimes all it takes is a well-placed troll to bestow an author with unimaginable support from other authors and readers who wouldn’t have ever given much consideration otherwise. In this case, the troll might have been offended over the author’s opinions, race, gender, politics, or whatever. Sometimes these things occur as natural interactions with the world at large, and sometimes they can be orchestrated as a risky and potentially rewarding marketing ploy. To use a personal example, if someone reviewed one of my books or posts and attributed it to just more trash written by a ‘privileged cis white male,’ suddenly there might be a vocal outpouring of support of folks who don’t believe sexuality, race, or gender of the author should weigh in on the quality of the work. If someone were to comment that disabled veterans like me shouldn’t be allowed to write such garbage, I might receive a ready stream of interaction from people who support veterans and/or those who support people with disabilities. For the record, I would never try to instigate anything like this. It’s just an example of how strong beliefs can be used by other people. Just like paying for reviews or page reads, trying to instigate something like this would be akin to playing with fire. I’ve often said that I believe the best way to prove a point is to do it badly in the wrong direction. I don’t know if it’s just the way we’re wired, but it seems like most people lend their greatest levels of engagement when they encounter things they are opposed to. Forget the great service you received or the people you can always count on. For the majority, it seems like the real memorable things are those you disagree with. Those who stand together in the face of what appears to be opposition, often stand bonded in their fight against a common enemy. If applied to this discussion, the intended outcome wouldn’t necessarily be the first-level support or opposition, but the secondary reactions that come in response to inarticulate, automatic responses from the offended. These angry people aren’t thinking about the bigger picture when they comment or engage, they just want to be heard. They want you to know they’re angry. I believe psychologists might inform us that in a state of agitation, we automatically drop to lower functioning brain sectors, which are far better suited for fight or flight than proper decision-making. You can also use offensive remarks to bolster support within political sectors of your fan-base. By demonizing one group, you might be heralded as a champion by another. You will hurt feelings in the process, but by offending one group of lukewarm fans, you can ramp up support and build a tribe of highly-focused super fans out of the other. Those who are familiar with the concept of the 1,000 True Fans approach to art might recognize the power super fans bring to the table. Again, this is just another case where alienating some (or even large numbers of) fans can have a positive business outcome. Aside from the obvious business repercussions of miscalculating your fan-base and ineffective use of strategy, there are other, non-business implications that I would like to discuss. First and foremost, I just want to suggest that even if your decision pays off financially, a win can sometimes be a loss. How is that possible? Well, I believe art is more than business, and whether you mean to or not, I believe causing discord within those who have connected with your art can be a psyche-damaging event. I don’t want to overlap layers to this discussion, so I’ll leave my reasoning for why this is significant for creatives until a later section. Really, what I want to say here beyond anything else, is that by taking another step backward, we can view the secondary and tertiary impacts. As I mentioned earlier, I believe art requires both a creator and a consumer to become whole. For authors, this means that your readers have told half your story in the time they’ve spent with it. The book may have taken you weeks, months, years, or even decades to write, but (whether you like it or not) the reader helped finish the journey. They allowed you into their mind, they trusted you with their sacred subconscious, and while it might not automatically pay the bills, this relationship means something. It’s strangely intimate, and cuts are never deeper than when intimacy is used as a weapon (or, perhaps more accurately for this example, the payload delivery system). If there is any truth to the idea that we see in others the things we hate in ourselves, which I believe there is, there’s something to be said for the impact of destroying thoughts and ideas your art exposed your reader to. Writing is such a personal endeavor that I struggle to imagine a possible situation where an author can completely isolate themselves from their art. Even if writing from an opposing viewpoint, the world is colored by our own experiences. So, if someone who might have considered themselves opposed to your beliefs begins to see new situations or comes to understand motivations a character might have that in some way humanizes them, all because of your writing, a subsequent violation of that intimacy will cause damage and the wounds will scar. Like an immune system detecting a foreign body within the subconscious, they may come to resent the changes your art inspired. This hatred and loathing might then be turned outward, fighting other such sources to eliminate potential causes of harm. All of the above might just be an obtuse way of saying that often injury begets injury. If your politics and beliefs and the way you express them leave someone feeling injured, they’re much more likely to pass that injury on to someone else in return. Even for just one person, an act of aggression can multiply ten-fold. When you aggressively alienate a whole subsection of fans and potential fans, the impact of your actions can be massive. What is it they often say about great power and what that comes with? Earlier, I warned that my wife often describes my passionate discussions as “Lecture Mode.” This means that, as far as she is concerned, there is a point in our conversations where, if reached, she shuts down. This doesn’t mean we’re incompatible or that she doesn’t love me. It just means that if I really want to reach her on a particular topic, I have to pay very close attention to my methods and behavior while trying to express my point. This would be a lot different if I were preaching to other folks who were primed or already charged on the topic at hand. Some authors write books where they are very upfront about their politics. Their online personas are very political, and there really isn’t a whole lot of room for confusion. I could definitely go into the merits of writing from a position of love, but I won’t. Sometimes people feel so passionately about things that the fire of outrage seems like the only tool that fits. In some cases, that might be true. For every person who is offended, there could be someone who finally feels like they fit in. Many brushes are used to create art, and I don’t think I’m qualified to tell anyone how or what they should create. I think most artists can be described as falling into the range of being more empathetic than average. In many cases, art is about expressing pain and wanting people to understand. We put our characters through trials and adversity and we take our readers on a journey from beginning to end. It is for this reason, I think, many artists tend to gravitate toward the ‘Left’ side of political topics. I think there is a genuine desire to right perceived injustices in the world. This, in itself, isn’t necessarily bad. The problem comes from being surrounded by people who believe so much differently than I do on topics that have become a powder keg. Since the election, this group has become very vocal in my social feeds and I view a lot of the responses to the election as hateful, fear-mongering, and just plain ugly. Since I’ve worked to build a network of other artists on Twitter and other social networks, I found myself surrounded by cries of fascism, racism, and sexism, and generally labeling anyone with a differing opinion as one of the above. As a person with a deep sense of empathy, this was killing me. Feeling like I couldn’t speak up was even worse. I would describe myself as being on the ‘Compassionate Right,’ if that’s a thing. I voted for Obama in 2008 because I liked some of the things he campaigned on and, honestly, McCain waffled on those same topics. I lived in Alaska for 4 years in the military and Sarah Palin kind of scared me. (If you think it’s because she’s a woman, you’re wrong. Alaska has had some interesting politicians and she didn’t seem like she fell far from the tree. I loved Alaska and dream of going back sometimes, but I always felt at odds up there politically.) I didn’t vote for Obama during his re-election campaign because it became apparent that he wasn’t going to follow through on those promises that won him my vote. Previously, I’d always considered myself a Republican, but I didn’t like the direction the party was taking. I didn’t vote for Trump and I didn’t vote for Hillary. If you really must know, I voted 3rd party. I put myself through college while serving my country, earning two associate degrees and finishing my bachelor’s a few months after getting out in 2005, then later finished a master’s degree with my veteran benefits. I guess that’s a long-winded way of saying who I am politically and that I’m “educated” and what some would call a self-made man or a boot-strapper. I don’t appreciate random strangers discounting me as having white privilege or calling me a cis white male like it’s some kind of derogatory insult. I’m proud to say that I was raised to be color-blind and I’ve fought “battles” (that have cost me personally and professionally) for people who weren’t born just like me. I’ve experienced loss so deep that I can’t begin to describe it here, just for standing up for what I believe is right. I’m a person with beliefs and convictions and I often feel like I’m constantly under attack by the ‘Hard Left’ (many of them being fellow creatives) just because of who I am (which I can’t control) and what I believe, despite what I’ve taken a stand for in the past. I put out a warning on my Twitter account a few months back that I would stop following people who were posting hate. I removed some Trump followers, but I stopped following far more people who were angry he won the election. Look, maybe you and I didn’t vote for him, but saying he isn’t your president says more about you than it does him. If he does something that violates the trust of our nation, or shows himself to be unsuitable for the office, there is always the route of impeachment. As a veteran, I respect that system. I’ve defended that system. And I just don’t see a way to change those core beliefs I’ve been instilled with. I have sadly had to stop following several authors who I respected as great storytellers and pillars in the writing community. This makes me terribly sad, but on a bigger scale it also means that I’m no longer receptive to the things they have to say. When I consider that, as a writer, it isn’t something I want to do with my fans.